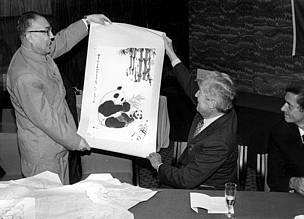 WWF has been active in China since 1980, when Dr. George Schaller arrived to work with Chinese scientists on field studies of the behaviour and ecology of the giant panda. As the first international conservation organisation invited to work in China, WWF faced not only the problems of carrying out field research in the panda's rugged, inaccessible mountain home, but also the cultural and political challenges of engaging in international cooperation in the early days of China's opening to the outside world. Nevertheless, a shared commitment to conservation made it possible for WWF-sponsored researchers, Chinese and Western, to lay important groundwork for giant panda conservation. Initial fieldwork shed light for the first time on the animal's life history. Joint WWF-Ministry of Forestry panda surveys provided population numbers and distribution estimates. Analysis of satellite imagery confirmed the dramatic changes in panda territory, showing a 50% loss of habitat between 1974 and 1989. WWF also provided support for the establishment of a breeding centre for pandas in the Wolong Nature Reserve. The most significant outcome of the first decade of cooperation between WWF and China's Ministry of Forestry was the creation of a management plan for the species. Adopted by China's State Council in 1992, the plan calls for the establishment of an additional fourteen nature reserves; improved management of thirteen existing reserves; and the construction of seventeen migratory corridors to enable interaction between isolated populations. In addition to panda conservation, WWF worked in several other areas during its first fifteen years in China. The last Pere David's deer in China were slaughtered in the early part of this century, but a small herd survived in captivity in England, on the estate of the Rothschild family. In the late 1980s, WWF assisted in arranging the re-establishment of a captive population of this species in China, and there are now two large captive herds and discussions of re-introduction into the wild. WWF was also active in providing training for China's wildlife conservationists. In addition to receiving classroom and field-based training in China, hundreds of Chinese wildlife conservation staff have attended free reserve management and wildlife management courses at the Mai Po Marsh Education Centre managed by WWF Hong Kong. For the first fifteen years WWF worked in China, we did not have an office based in the People's Republic of China. Our team which was initially based in Switzerland then later in Hong Kong travelled to China to implement and monitor projects. In 1995, Dan Viederman, China Programme Director relocated to Beijing to establish the WWF China Programme Office (CPO). When WWF CPO was officially opened in 1996, there was nine staff working on four critical programmes: Giant Panda Conservation, Energy Efficiency, Forests and Environmental Education. Establishment of the office in Beijing allowed WWF to build closer ties with our partners in the Ministry of Forestry (now the State Forestry Administration), and to develop new partnerships at the national and local level. As of 2010, WWF has more than 120 staff working in China on a broad range of conservation programmes including species, freshwater, forest, marine, climate change and energy, the green economy and footprint. In 2010, WWF celebrates 30 years of conservation work in China. Our major achievements over that time include supporting the establishment of 62 giant panda nature reserves, the protection of over 1.64 million hectares of wetlands through the Yangtze Basin wetland conservation network, and the certification of close to 1.25 million hectares of forest as part of the Forest Stewardship Council’s responsible management system. Working with partners, we have promoted sustainable business practices and launched China’s pioneering low carbon demonstration cities, Baoding and Shanghai. WWF has also raised awareness about conservation and sustainability issues and encouraged the public and the private sector to take action through activities such as the 20 Ways to 20% energy saving initiative and Earth Hour, the world’s largest climate change action campaign.